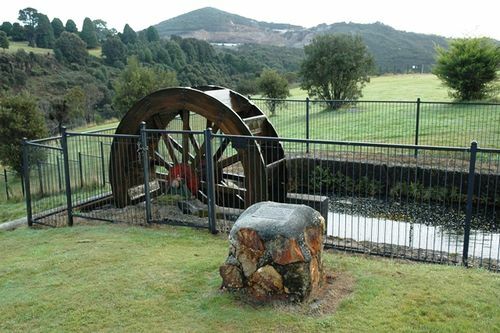 A monument commemorates the first industrial site in Australia to be lit by hydro-electricity. The Mount Bischoff Tin Mining Co. was formed in August 1873 and mining began on December 14 1873. When the mine finally closed, in 1947, it had produced 81,000 tonnes of tin and provided a dividend equal to £200 for every £1 initially invested. At its peak the town, which now has only a few hundred residents, had a population in excess of 5,000. The first rail line on the West coast opened in July of 1884, which connected Waratah to Emu Bay now known as Burnie. One of the earliest known hydro-electric power stations was opened in 1907. It supplied power to the crushing mills and electric tram and cable cars that brought ore from the mine to the mills. Most Waratah homes were wired for electricity in the 1930's and for two shillings rental could use as much power as they liked as there were no meters. The late Dudley Kenworthy, the final man to run a mining enterprise on the mountain, operated a stamper mill, a single-head stamp battery. It’s purpose was the first step in the process of separating the tin from the waste rock, hence it crushed the ore from the mine. This stamper was located on the side of the hill adjacent to the falls, and it’s ‘thumping’ provided a continuous background noise to the residents of Waratah.